Stretches of the Tennessee Rock Trail are steep as it climbs up and over Black Rock Mountain in Northern Georgia. The ribbon of deep brown soil is cross-hatched by exposed tree roots rubbed glossy by the soles of hikers’ shoes. It is spring, but brittle fallen leaves, silvered and curled with age, still litter the ground. The trail has the directness of other eastern trails I’ve hiked. There are few switchbacks. When it is time to go up, it just goes up. The damp air, scented with moist earth and wet stone, hangs about the mountain’s flanks and drapes itself across our shoulders like a friendly arm. Clouds stretch northward in varied shades of gray, diffusing the light into an indistinct wash. Looking out at the vast, layered jumble of the Blue Ridge Mountains, I am reminded of how ancient the Appalachians are. They are weathered, lumpy rather than jagged, rounded by time. In the distance lay the Smokies, nestled in the mists, beckoning. The trail crosses the Eastern Continental Divide, which is marked by a large sign. The children and I straddle the line, grinning, as if each of our feet is now pulled in a different direction like the rivers of the region. On one side, streams run to the Mississippi and then to the Gulf of Mexico. On the other, water flows to the Savannah River and the Atlantic. The elevation here is about 3,600 feet, high for Georgia. As we hike, we catch a quick glimpse of the road just beyond a section of wooden fence on which hangs a large sign that commands us to “Stay on Trial.” The road itself is a reasonably unobtrusive strip of asphalt that shows some age, fine cracks running through it like lines on a weathered face. The trail takes us right up to the fence, then turns abruptly away to head back across the mountain, back into the woods. The road recedes in space and in our minds. I notice no noise from it. Whether that is due to the lack of traffic or the sound being blocked by the humped ridges of the mountain, I cannot say. Throughout the hike, I am amazed at how much trillium there is. They are unlike any I have known. The flowers are a rich, deep red, like port wine, surrounded by three small leaves of green blushed with red, which are in turn set upon a base of large, variegated leaves marked by patches of dark and light green. 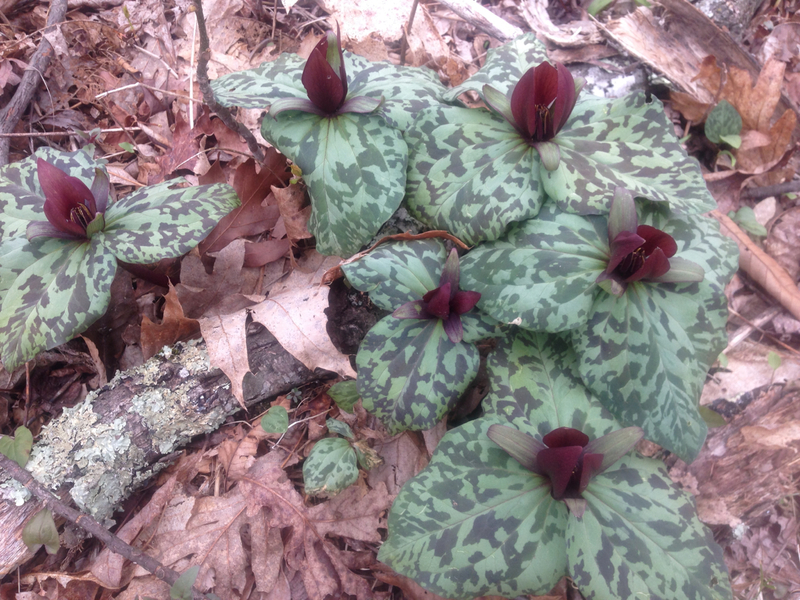 The trillium are often joined by bloodroot, their funny, hand-like leaves waving in the breeze, some of the bobbing stalks topped with open, white flowers, others with swollen buds. A multigenerational family hike moves along at varied paces. The children race ahead, then return, like spiders leaving the web on threads and pulling themselves back again. On some of their forays, they perch on large, rough boulders, taking pride in scrambling up the rocks and leaping down again. We hang back from them, letting them have their space, their chance to explore without the feel of watchful eyes. My wife and her folks and I walk most of the time in an extended line, my wife and I mindful of the children ahead and their grandparents behind. We all join together and chat happily at some times and are separate and silent at others, enjoying the sounds of the wind and our shoes crunching on the path and the fresh, spring leaves rustling and twisting. On this cool, damp day on the trail, it is just our little party and the birds, which twitter on the mountainside and dance on tree branches. After the first short stretch of the hike, we do not see another soul. On the summer day that I hiked it, there were a lot of people at the top of Mt. Chocorua in the Sandwich Range of the White Mountains. I was surprised to see them, because I didn’t hear them from down below, even as I neared the summit. The entire way up the mountain, I had seen a tiny handful of people, yet here were much more than a handful. Most had come up the trail on the other side, and though I knew the mountain was popular, I had no idea that I’d end up among so many people. Groups, some quite large, were sitting all over the boulder-strewn top. A few dogs cavorted among them, showing off their four-wheel-drive agility on the rocks. Despite my surprise and even disappointment at seeing so much humanity so suddenly after such a quiet hike, I also felt the companionability common to hikers. As I reached the top, several nodded and greeted me. I spent a few minutes wandering the mountaintop, making sure to tap my toe on the U.S. Geological Survey summit marker, and eventually settled on a spot facing the Presidential Range to eat my lunch. Winter-related hazards can await in Tuckerman Ravine, even in late June. Mt. Washington’s broad shoulders were visible, though the peak was lost in gray clouds. In a line from Mt. Washington, I thought I could make out Mt. Monroe’s asymmetrical peak and Mt. Eisenhower’s domed pate, and I thought about standing atop each just over a month earlier. The White Mountains of New Hampshire are beautiful and rugged and unpredictable. Though they lack the altitude of the Sierras, Cascades, or Rockies, I sometimes describe them the way I describe certain basketball players: they play taller than their height. They spring from fairly low-lying surroundings, making for plenty of elevation gain. And they sit at a spot where significant weather patterns converge. Dangerously high winds are possible on the ridges and peaks, particularly in the Presidential Range; even when not dangerous, the wind is almost always strong. Clouds can roll in and descend in an instant, taking visibility down to nearly nothing and making you grateful that the high-elevation trails are marked by huge cairns. Those clouds can chill you to the bone, and sudden snowstorms have occurred even in the summer months. Hypothermia is a constant threat. The tree line dips below 4,000 feet. Jutting upward to meet the wind and storms, the mountains help make the weather, and the weather, in turn, remakes the mountains. Experiencing the Whites is about the weather and so much more. The hikes up to the peaks and ridges run through beautiful forests and along swift streams before bursting above tree line into fields of boulders. On the ridges that run between the peaks, the views on either side stretch out before you in a magnificent quilt of rocks and trees that runs to the next set of mountains. Nestled below the shoulders of Mt. Washington are two vast, steep bowls: Tuckerman Ravine and Huntington Ravine. Curved and oriented perfectly to capture winter storms, Tuckerman develops a tremendous snowpack during the winter, and the trail up the headwall doesn’t open until approximately midsummer. Huntington is steeper, harsher, riven and jagged. The hike up it is considered one of the most challenging in the Whites; hiking down is too difficult and dangerous for most. Roughly between the two ravines runs a trail through the Alpine Garden, a rocky meadow of sedges marked by a variety of alpine flowers, the likes of which I’ve only seen at much higher altitudes in the Sierras, Cascades, and Rockies. Tuckerman Ravine from the ranger station near its base. The trails up to the ridges and peaks of the Whites have very few switchbacks. They just go up, which sounds practical enough when I write it here but can feel kind of insane when you’re actually hiking. When I was in high school in Los Angeles, where we were perhaps a little too “blessed” by interesting geological features and events, one of my best friends and I frequently went hiking in the Santa Monica Mountains. The Santa Monicas run right to the sea, and parts of them – even near the city – are remote enough that you can lose yourself in them. That’s all we wanted to do. One of our favorite hikes started on the Chumash Trail, an old Chumash Indian route that shot straight up to a ridge from the coast on a thin ribbon of soil through low brush and prickly pear. No switchbacks. Trails in the Whites are like that, too, but longer and far rockier. On the Chumash, I was always surprised to turn around after just a little while, quads and calves burning, and see that the car already looked tiny far below next to the grey of the Pacific Coast Highway, the yellow sand, and the sparkling ocean. In the Whites, the surprise comes as you suddenly emerge above tree line into the alpine domain, and you turn and take in a view that makes you wonder why you hadn’t done all of this sooner. Most days, I would like to walk up a mountain. That feeling started for me in Yosemite National Park and the Mammoth Lakes region of the Sierras, and it continued in the Santa Monicas and Lassen Volcanic National Park and the Cascades and the Rockies. The Whites have found a place in my heart, too, even though my experience of them is limited to just a couple of trips. I plan to take many more over the years, including this summer. It is rare for a day to go by without me thinking about how nice it would be to be heading upward.